Come and experience the Tuli magic ... a timeless Botswana safari in a majestic wilderness setting, easily accessible from South Africa. Situated within the Northern Tuli Game Reserve which is located in the easternmost corner of Botswana, close to the Mapungubwe World Heritage Site in South Africa. Here is a unique, timeless corner of Africa where nature and culture combine in spectacular wildlife, breathtaking landscapes and fascinating history. Set in spacious gardens along the banks of the Limpopo River against a backdrop of stunning sandstone outcrops, Tuli Safari Lodge is also unique. Here the welcome is genuinely warm and the ambience is charmingly ageless. Each day brings a new adventure as Tuli offers a truly authentic wildlife experience. At Tuli, you set the pace ... with varied activities to enjoy and idyllic grounds to relax in. Game drives and bush walks with exceptional guides, hides tucked away in the bush (where you can also stay overnight for the ultimate back-to-nature experience!) and horse rides in the wild. Eight cosy suites, a sparkling pool, various game viewing points and peaceful gardens await your return to the lodge. Tuli Bush Camps is a portfolio of self-catering camps in the Tuli area, managed and operated by Tuli Safari Lodge. Tuli Bush Camps are great getaway destinations, easily accessible from South Africa, and ideal stop-off points when travelling between Botswana and South Africa. Molema Bush Camp is a self-catering bush camp offering en-suite chalets and campsite accommodation on the banks of the Limpopo River. Molema is located on private land immediately to the west of the Northern Tuli Game Reserve in eastern Botswana, close to Platjan border post. Game activities available, as well as a self-drive trail within Molema's bounderies. 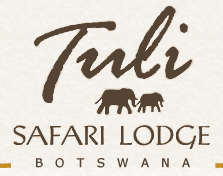 Mission Responsible tourism is key to Tuli Safari Lodges's operating philosophy. We are commited to protecting and conserving the area's environment and wildlife, and contributing to community upliftment through employment, business opportunities and charitable programmes.